My new website is now up ad running at www.ElizabethCarmel.com. I was pleased with the process at Livebooks and feel that this website is an improvement on my previous one, which was made with iweb and was incompatible with some browsers. I welcome any comments or feedback either via email or via the blog comments. The main improvements are: more detailed online pricing customized for each image, larger image displays, downloadable pdfs of the portfolios, online print ordering, and a more professional / well designed look. We will also be using livebooks for my husband Olof's website update - his current iweb based site is at www.Carmelstudios.com. 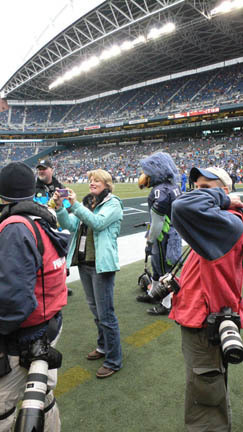 We went to the Seahawks game in Seattle yesterday - thanks to my brother in law we were able to get on the sidelines - here is a shot of me shooting side by side with the Sports Illustrated guys (I am using my iphone for pictures, no big cameras allowed on the sidelines without a press pass). I hope to snag a press pass for the next time I go to a game, then I can bring the H3d with the 300 mm zoom and the Canon 5D and the 400 mm zoom. Elizabeth - your site is simply stunning and your work is quite inspirational. I am normally not a fan of fancy flash-based sites, but yours is quite elegant and easy to use. Very well done. I must admit I felt a little like a drunken sailor trying to over over the thumbnails. The link to the photoblog also wants to come up as a popup - so some people's browsers might block that. It is a wonderful showcase of your work.